Harvard Pilgrim recently completed its five-year IT strategy in which security played a major role. 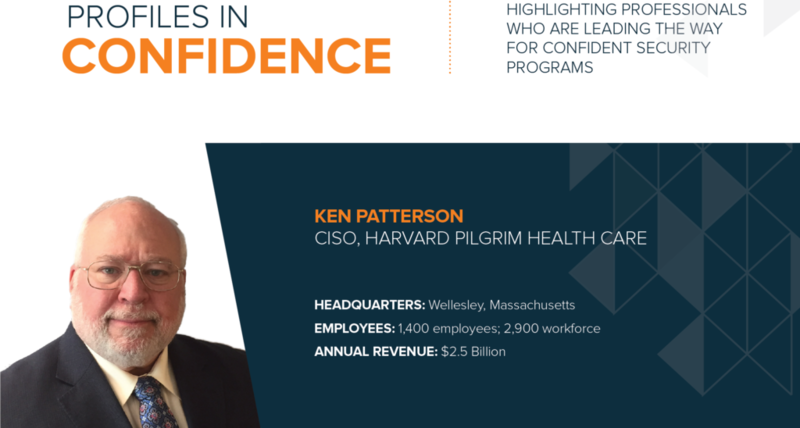 Patterson is now focused on a three-to-five year roadmap at Harvard Pilgrim. To accomplish these goals, Patterson starts with ensuring he is fully integrated into the business mission, goals, and approach. “We have a top down push of our objectives; our CEO pushes down to our CIO, and she pushes these goals down to her direct reports. We all try to understand how we can align with those performance goals,” says Patterson. • INNOVATE - Grow membership in selected market segments by using pragmatic innovations in product and network design, provider partnerships and payment models, and customer decision-support and wellness programs. • DIVERSIFY - Continue to diversify by expanding our business geographically and demographically. • MANAGE COSTS - Strengthen our competitive position through a campaign of disciplined cost management. • Integrate with the Business - Listen to business executives and understand what they want to get done and be a facilitator - help them get to their goals. • Increase your Business Acumen – Similar to what others in the industry have recognized, Patterson points out that CISOs are often promoted for their technical background, but it takes a different skill set to be a successful CISO. New CISOs need to master the skill of business communication and place security within the realm of business goals when articulating strategy and advocating for security budget and priorities. • Work your way up to the board - For many CISOs there are still at least one (and often more) layers of management between them and the Board. CISOs who do not have direct access to the Board should focus on making their case to other executives. Patterson suggests CISOs prove their communication skills and value to CIOs, CEOs, and CFOs to gain access to the Board. • Be Prepared - Patterson says he meets with his CEO before presenting anything to the Board. This way he is prepared for questions, and he has the support of the CEO in the room. Patterson and his team work hard to improve privacy and security around compliance with regulations, which has helped instill a security-focused culture. “My executives send me emails concerning recent articles they read about security because it often captures their attention. They understand the importance of being prepared and have helped me advocate this to our entire workforce,” says Patterson. Harvard Pilgrim requires security training for all employees, resulting in an organization-wide understanding of the consequences of a breach in terms of financial loss or reputation. “We make good use cases to demonstrate what could happen here and how we build a process to rapidly detect and respond to any incidents that occur. Even if something minor happens, the workforce knows about it,” comments Patterson.